Real Bread Week is the annual, international celebration of supporting your local, independent Real Bread bakery and baking your own. In its 10th anniversary year, #RealBreadWeek runs from 24 February to 4 March 2018. 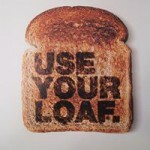 For lots of ideas Use Your Loaf. A couple of links to local bakeries . . .